It's that time of year when you can begin to start getting excited about your school prom. Before you get too excited, you need to make sure you are organised and think about what to wear, who you are going with, how to have your hair and how will you get there. The school prom is about fashion, beauty and grooming - it's your biggest social event of the year! 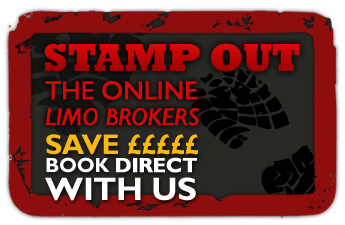 Hire Limo Birmingham can help! We would be delighted to offer you the opportunity to hire one of our smart, contemporary and stylish limousines. You will be spoilt for choice with us; we have H2 Hummer Limos, Lincoln town car limousines, Pink Limousines, Lincoln Navigator limos, super stretched Hummer limousines or C300 limousines (a.k.a Baby Bentley Limousines). Each provides a glamorous look for that special occasion of your school prom. You will look good and feel great on your prom night arriving in one of our stylish 30 foot long limousines. They can travel with up to sixteen passengers, get a group of friends to share the cost and you will be pleasantly surprised at the cost per person. At Hire Limo Birmingham we pride ourselves on our professional and friendly chauffeurs that will provide door to door service. They will collect you and your friends from your home in your chosen limousine and take you to your prom. Prior to you arriving at your prom destination, we will ensure you get opportunity to cruise around the city in your limousine. You could sit back and enjoy waving to on lookers, or have some fun with the entertainment systems. Most limousines have features include DVD player, CD player, Disco lighting system, flat screen TV and refreshments. Feel free to provide your own CD collection to be played en route to your prom destination. 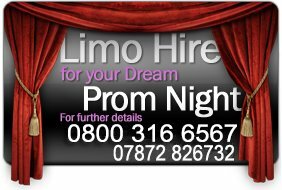 The limos have great sound systems and interior lighting - you will think you are already at the prom or in a nightclub. Your prom night will be night to remember when travelling with Hire Limo Birmingham. You and your friends will be dressed in tuxedos and ball gowns and will definitely be dressed to impress! Hire Limo Birmingham will ensure you impress on arrival as you step out of one of our stylish and luxurious limousines. The chauffeur will open the limousine door and heads will turn with envy as you step out of your limousine. The prom will be one of the most important events in your schooling experience and a night which you will look forward to for months. So spoil yourself and feel fabulous as you mark the end of your school year with Hire Limo Birmingham - it will be such a buzz!